Chance the Rapper led a "parade to the polls" Monday evening after performing at a free concert in downtown Chicago. 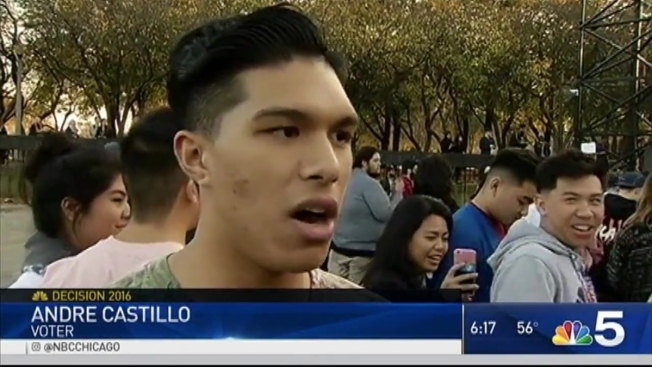 The Chi-town native, whose real name is Chancellor Bennett, hosted and headlined a get-out-of-the-vote event at the Petrillo Music Shell in Grant Park. The concert, sponsored by Chance's non-profit organization Social Works, featured performances from a slew of local talent, including rapper and activist Malcolm London, rock outfit Twin Peaks and Chance's brother, rapper Taylor Bennett. After the show, Chance led concertgoers through rush-hour traffic to an early-voting site, where there was already a long line of voters waiting to vote. Chance went inside and the polling place cast his ballot. But this isn't the "Coloring Book" rapper's first dip in the politics pool. In September, he teamed with the NAACP for its #StayWokeAndVote campaign to register concertgoers to vote during stops of his Magnificent Coloring World Tour. Chance is the son of Ken Bennett, who served as Mayor Rahm Emanuel’s first deputy chief of staff and director of the office of public engagement before taking a job with Chicago’s tourism bureau earlier this year, Crain’s Chicago Business reported. Additionally, Bennett previously served under Mayor Harold Washington and President Barack Obama.